I pulled my poleaxe out of the dead knight before me and looked at the bridge on the horizon. Amidst the fire and dust I see my foot soldiers being ripped apart by a samurai and a viking, while my own samurai desperately tries to hold them off. I run towards my ally as fast as I can, avoiding fire and catapult projectiles only to watch him get brutally executed by the time I approach. The two enemies swiftly turn their focus and chase me down; I quickly find myself outnumbered, with no allies anywhere nearby. I stood my ground, ready to put up the best fight I could. The viking player quickly shoved me into a wall, and I turtled up the best I could, blocking both opponents from all angles. Eventually, I wormed my way out of the corner and tossed the viking over my shoulder into the deep canyon below. I had a surge of confidence, squaring up against the enemy Orochi player 1 on 1 and I couldn't help but feel my heart beating faster. 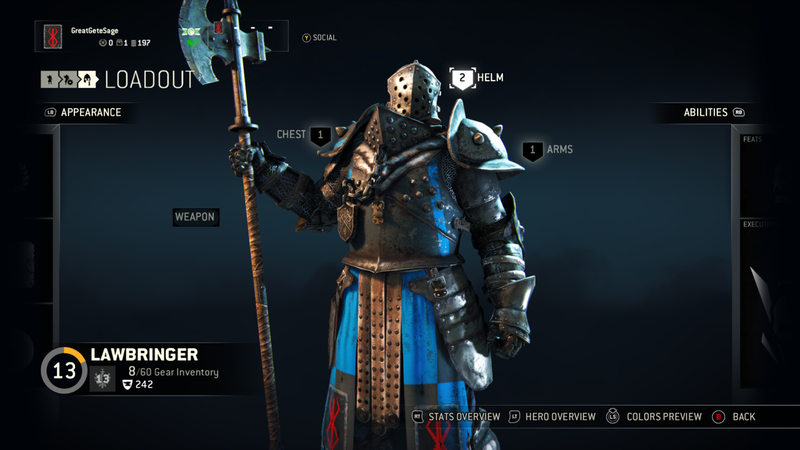 The orochi class has speed on his side, but my Lawbringer is tanky, with multiple unblockable attacks, and easily twice the size. I tried to toss the Orochi around and take him out with heavy blows, but his ability to parry and move around my guard proved to be a problem as he slowly widdled my health bar lower and lower until I realized...I'm probably going to die here. The orochi became relentless swinging at me from all angles to try to take out what little health I had left, while I frantically blocked the blows. The Orochi focused so hard on his perceived prey that he failed to keep an eye on his own stamina bar, which he had exhausted in his onslaught. I saw it as my chance to retaliate, tossing the depleted samurai to ground, slamming my poleaxe on him and ending the fight just like that. I was pumped after winning the tense battle and did a celebratory emote, which I immediately regretted as a peacekeeper ran up behind me and ended my dance with a dagger in the back. 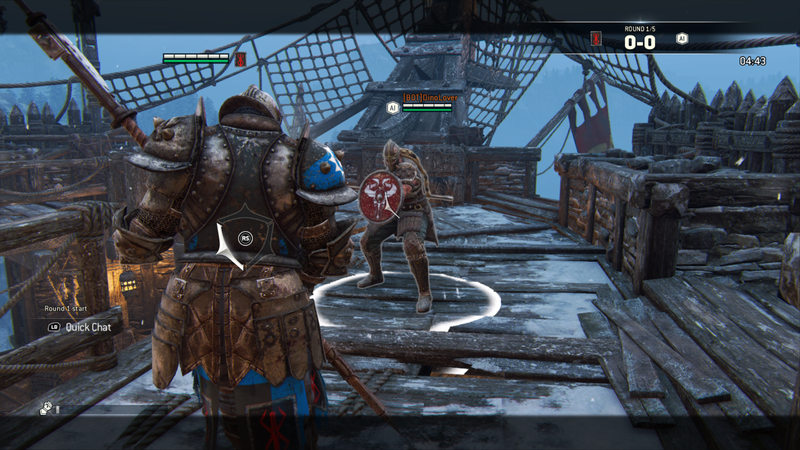 These are the situations you find yourself in very frequently when playing For Honor, and those tense moments of combat make Ubisoft's latest multiplayer game an incredibly unique and exceptional experience. However, some of Ubisoft's decisions undermine the marvelous framework set in place to foster a multiplayer experience like no other. For Honor's narrative is best described as a History Channel show that takes place in an alternate world where traditionally styled vikings, samurai and knights are locked in warfare in a different world, mostly due to resources. There is certainly a plot, touched on in the surprisingly fun campaign, but it is mostly in place as a relatively deeper way to explain why I get to combat medieval knights with Edo-era-esque Samurai, which is the centerpiece of this hack and slash/fighting game hybrid. Lawbringer squaring off against a Valkyrie in the "Art of War" system. For Honor's combat is elegant and realistic, creating a deceptively simple and flexible system for players to swing around historically accurate weaponry. Despite being easy to understand, this system is insanely deep with dozens of strategic possibilities per second, easily making it the absolute pinnacle of this type of combat to date. Ubisoft has appropriately dubbed For Honor's unique combat system, "The Art of War". The Art of War has players locking on to a single opponent, essentially entering a duel stance. While players can guard attacks from enemies they are not locked on to, the system is designed for players to deal with threats one at a time, and threats can be switched to quickly and easily. While locked on, players may enter 3 different stances with a flick of the right stick, opening up offensive options in that stance, or allowing players to block incoming blows coming from that angle. Warriors have access to multiple combos, parries, guard breaks, throws and even powerful unblockable attacks. When paired with a wide and varied roster with unique move sets wielding weapons like flails, katana, longswords and axes, it's hard not to feel invested in each and every second of combat. As I mentioned above, there are a wide variety of characters to pick up and try to master. Almost no skill from one character carries over to the next, with each hero playing very differently and distinct. Players start with one character of each faction but can relatively quickly unlock them all, if they wish. Players get a chance to try out most of these characters in a pretty short, but surprisingly satisfying campaign mode. The plot is a bit messy and presented poorly at times, but the combat remains a highlight, even in single player (or co-op!). Outside of the marvelous set pieces and voice acting, the real fun begins when you bring one of these warriors into the multiplayer battlefields. Players can chose from 5 gameplay modes including a unique 4v4 control point mode, riddled with AI fish food. There is a 2v2 deathmatch mode, as well as a 4v4 called Elimination/Skirmish. Lastly, and 2 of my favorites are Brawl and Duel, which are 2v2 and 1v1 modes respectively, relying on melee skill alone to become victorious. While all these game modes are excellent ways to test your prowess, Dominion is one of the easiest game modes to jump into. Things are much more fast paced, and sometimes end in you being double or triple teamed as your team tries to capture and control points. This can be a bit frustrating at times but all is fair in love and war. Each character is equipped with tiers of "feats" which become available by earning renown, obtained by killing AI grunts, capping points and dispatching other players. These feats include passives, combat abilities and even the ability to call in catapult fire but they all only add to the variety and intensity of combat, even when you get pegged by a random arrow. To top it all of, players can customize their favorite heroes in a plethora of ways. Whether it be armor, weaponry or simply changing paint schemes and colors, you would be hard pressed to find two warriors of the same class that look the same. Some gear like weapons and pieces of armor also have statistics tied to them, on top of aesthetic. Weapons can add damage while sacrificing defense, increase your ability to parry and even raise your health. These benefits are disabled in the heavy skill based game modes like Brawl and Duel, but cause some interesting waves in games of Dominion. I don't have any gear to write home about, but I like my helmet! Unfortunately there are some blaring dents in the armor I need to address. The first thing to discuss is Ubisoft's approach to microtransactions, because For Honor is absolutely littered with them. 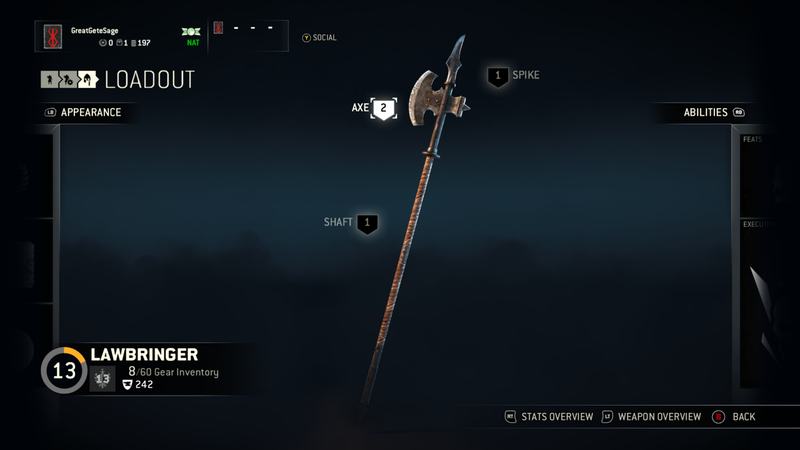 Almost all content is locked behind a varied price of in game currency labeled as "Steel", including heroes, outfits, emotes, executions and even all of your heroes feats VERY early. You can also use steel to unlock a variety of crates, which contain pieces of gear you can equip your heroes with. Steel can also be used to give your account "Champion" status which gives you the benefit of increased experience gain and exclusive gear. Players can bank a lot of steel thanks to the "Orders" you can fill in-game, which are essentially quests. Sometimes they are as simple as playing 3 games of one mode and usually net you 400 steel. It's important to note players can also buy steel with real currency in various amounts. 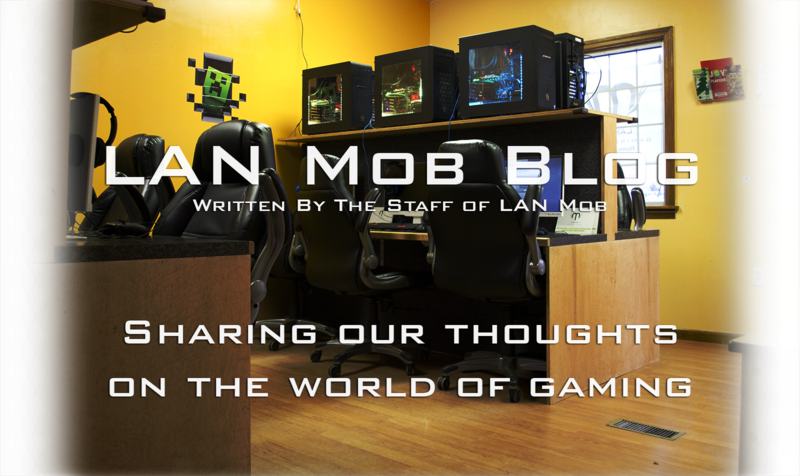 Microtransactions make for an interesting topic of discussion and many people feel very strongly one way or another. 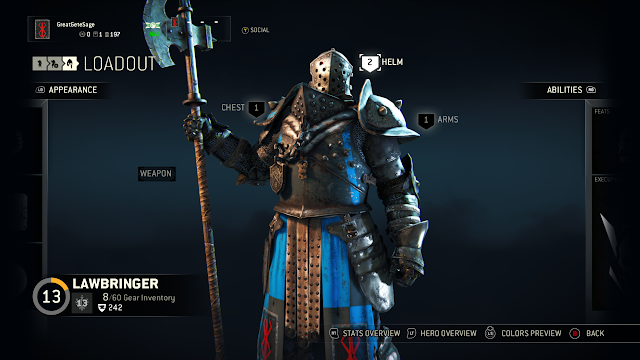 I don't believe Ubi's model is completely unfair, since all of this content can be unlocked by simply playing...a lot, but it is something to be aware of before you jump in. 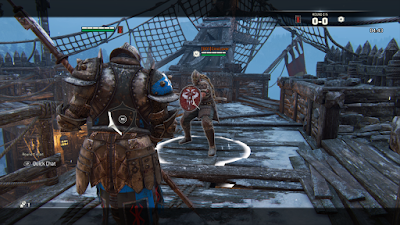 Despite the tense battles and epic environments, the most difficult battle presented in For Honor lies within its online infrastructure. There are an insane amount of networking issues currently plaguing Ubisoft's title, varying from party dismantling disconnects to simply not getting past character select before you get booted. My friends and I have spent upwards of half an hour just trying to get into a game only to get promptly kicked because the host leaves. This problem is mostly due to Ubisoft's decision to make their matchmaking utilize peer to peer connection as opposed to dedicated servers, and I cannot stress how much of a mistake I believe it is. I could not praise the gameplay anymore, but not being able to actually play it is a huge problem. Technically the problem exists because of the own player-base quitting games early, but it doesn't make it sting any less, especially when you're having a great game. Ultimately For Honor has surpassed every expectation I had for it, besides poor matchmaking. Ubisoft has big plans for the unique multiplayer game including new heroes, stages and a constantly evolving experience, and I can only hope they focus on addressing the networking problems soon. 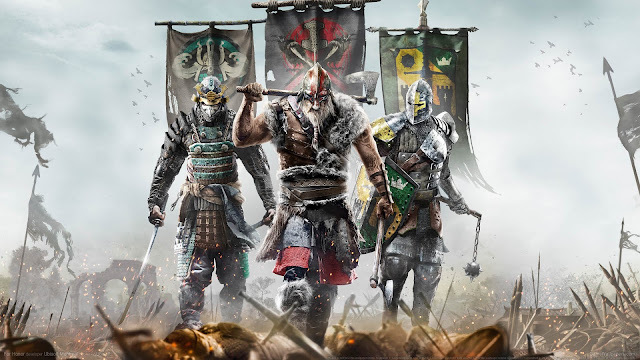 We've had a few games right here in the shop where our consoles got to host and everyone seems to agree that For Honor perfectly scratches the itch for tense melee combat that games like Soul Calibur and Bushido Blade tried to. I can't help but believe that For Honor has the potential to become a mainstay right here at the shop; as legendary as the heroes you get to become. If you're reading this the week of publication, we're actually throwing a midnight tournament at this weekend's lock-in! Come on down and prove yourself as the strongest warrior in 1on1 combat, check our event for more details!